"READ: Rave Heart is accepting members." Rave heart is closed and opened on this time. Sunday-Open until 10:00pm my time. Tuesday- Open at 7:00-10:00pm my time. Wednesday- Closed until 4:55pm, and closes at 10:00pm my time! Thursday- Closed until 5:00pm my time. Where Everyone Raves Their Heart Out! Rave Heart is new at this moment, so please join! Rave Heart is always looking for more members, so if you wanna join, just comment me saying that you wanna join. Your net name will be posted as a link below, so anyone who comes on this profile will see it, and be able to add you, and stuff like that. Think of Rave Heart as your feedback for joining the club. *Note* I added my other account cause I wanna be a part of my own club dealy, so yah! Rave Heart, where everyone raves their heart out! What are the ranks for? Well, as soon as I get enough members I will be choosing FOUR people to help me manage, this only means that they need to post a link on their profile leading to the Rave Heart profile. Also, anyone who is a club manager will need to help ANY of the club members in need of help, this includes everything. Anyone who is a club manager should be honored to be one, because Im choosing very carefully, so watch out, you could be the next manager of Rave Heart! Where everyone raves their heart out!! Our logo and/or moto is..""Rave Heart! Where everyone raves their heart out!!"" It comes from the first graphic on my profile. 1.Dont tell anyone they cant join, unless they like miley montanna. 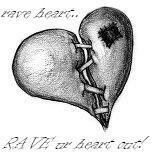 2.ANYONE who is a member of raveheart will need to post a certain graphic on their profile, here's the link. 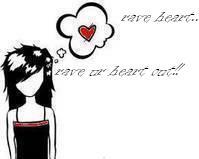 Clikk H3r3 to copy and paste the Rave Heart graphic to your profile, please and thank you! WE KNOW WHAT RAVES YOU THE MOST!! Login or register to add Rave Heart as your friend!